* This update completed at 11:40 PM (PST). 1. BPM Ranger Revamp: You can set your own BPM range when you select songs to play. - You obtain doubled Cash. Don’t miss this offer! * Please note that it's only one time offer per charge amount. - Play the game to collect Tear Stamp which you can change to following rewards: Personal Emo(7days), Double Power and 80% Off Coupon. - You can obtain new Halloween costumes at 40% discounted price. The packages include free Vampire face! 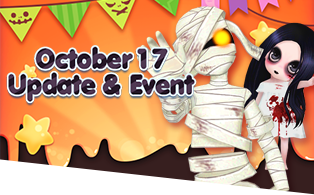 - A lot of Halloween items are available, including Woonden Coffin vehicle, VIP room and Skin/background. - Let’s fly by Thorn Wings which has different colors and buff. - Team up with your friend and play 2 vs. 2 against NPC! You can obtain one of rewards daily: 50% Off Coupon, Hair/Top/Pants/Shoes Coupon (1day), Love Power and Lala Magic.